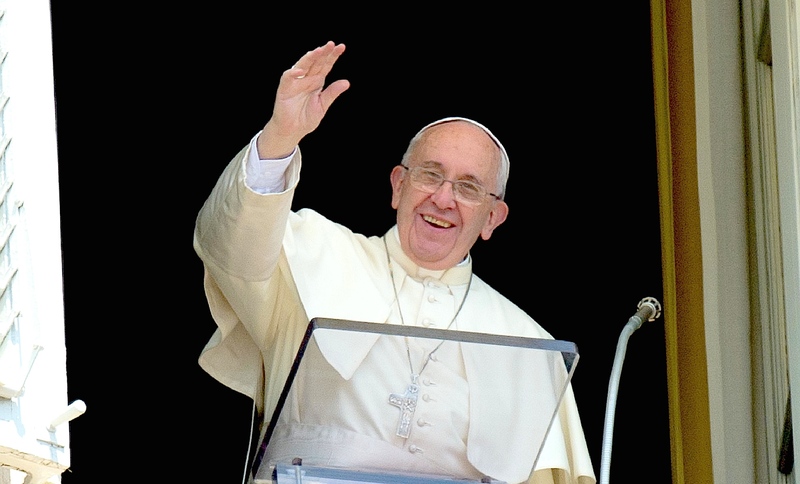 Here is a ZENIT working translation of the address Pope Francis gave today before and after praying the midday Angelus with those gathered in St. Peter’s Square. In today’s Gospel passage (Mk 4:26-34), Jesus speaks to the crowds about the Kingdom of God and the [dynamisms] of its growth. He does so by telling two short parables. In the first parable, the Kingdom of God is compared to the mysterious growth of the seed, which is thrown on the ground and then sprouts, grows and produces the ear, regardless of the care of the farmer, who at the end of maturation provides for the harvest. The message that this parable gives us is this: through the preaching and the action of Jesus, the Kingdom of God is announced, has burst into the ‘field’ of the world and, like the seed, grows and develops from itself, out of its own strength and according to humanly non-decipherable criteria. In its growth and sprouting throughout history, it does not depend so much on the work of man, but it is above all an expression of the power and goodness of God, of the power of the Holy Spirit Who carries on Christian life in the People of God. Sometimes history, with its events and its protagonists, seems to go in the opposite direction to the plan of the heavenly Father, Who wants justice, fraternity and peace for all His children. But we are called to live these periods as seasons of trial, hope and watchful waiting for the harvest. In fact, yesterday as today, the Kingdom of God grows in the world in a mysterious way, in a surprising way, revealing the hidden power of the small seed, its victorious vitality. Within the folds of personal and social events that sometimes seem to signal the sinking of hope, we must remain confident in the silent but powerful action of God. This is why, in moments of darkness and difficulty, we must not break down, but remain anchored in fidelity to God, in His presence that always saves. Remember this: God always saves. He is the Savior. In the second parable, Jesus compares the Kingdom of God to a mustard seed. It is a very small seed, yet it develops so much that it becomes the largest of all the plants in the garden: an unpredictable, surprising growth. It is not easy for us to enter into this logic of God’s unpredictability and accept it in our lives. But today the Lord exhorts us to an attitude of faith that overcomes our plans, our calculations, our forecasts. God is always the God of surprises. The Lord always surprises us. It is an invitation to open ourselves more generously to God’s plans, both on a personal and a community level. In our communities we need to pay attention to the small and great opportunities for goodness that the Lord offers us, letting ourselves be involved in His dynamics of love, welcome and mercy towards all. The authenticity of the Church’s mission is not given by the success or gratification of the results, but by going forward with the courage of trust and the humility of abandonment in God. Go ahead in proclaiming Jesus and with the power of the Holy Spirit. It is the awareness of being small and weak instruments, which in the hands of God and with His grace can do great works, advancing his Kingdom which is “justice, peace and joy in the Holy Spirit” ( Rom 14.17). May the Virgin Mary help us to be simple and be attentive in collaborating with our faith and our work in the development of the Kingdom of God in hearts and in history. Yesterday, in Caracas, Blessed María Carmen Rendíles Martínez, founder of the Siervas de Jesús de Venezuela sisters, was proclaimed Blessed. Mother Carmen was born and died in Caracas… Together with her sisters, she served with love in the parishes, in the schools and next to the neediest. We praise the Lord for her faithful disciple and entrust our prayers for the Venezuelan people to his intercession. And we salute the new Blessed and the Venezuelan people with applause! With concern I follow the dramatic fate of the people of Yemen, already exhausted by years of conflict. I appeal to the international community to spare no effort to bring the parties involved to the negotiating table urgently and to avoid a worsening of the already tragic humanitarian situation. Let us pray to Our Lady for Yemen: “Hail Mary …”. Next Wednesday will be the World Refugee Day, promoted by the United Nations to draw attention to what we live, often with great anxiety and suffering, our brothers forced to flee their land due to conflict and persecution. A day that, this year, falls in the wake of the consultations between the governments for the adoption of a World Pact on Refugees, which is to be adopted within the year, such as that for a safe, orderly and regular migration. I hope that the States involved in these processes will reach an agreement to ensure, with responsibility and humanity, assistance and protection for those forced to leave their country. But each of us is also called to be close to the refugees, to find moments of encounter with them, to value their contribution, so that they too can better integrate themselves into the communities that receive them. I greet all of you, dear Romans and pilgrims, especially those from Spain, Malta, Brazil – these Brazilians are noisy! -, from the United States of America; the students of the “London Oratory School” and those of the “Colegio Oratorio Festivo” of Novelda in Spain. I heard that among you there is a group of Argentineans. Remember that today in our country is Father’s Day. Remember your fathers in your prayers. I greet the faithful of Teramo, Francavilla a Mare and the group from Catholic Action of Trento; the recently confirmed young people from Campobasso; the Association of Italian Ecclesiastical Librarians and the “A Meeting, a Hope” Group from Olbia. I wish everyone a good Sunday. Please do not forget to pray for me. Have a good lunch and goodbye!